You may well have seen this high-speed sport on the TV. Ski and Snowboard Cross attracts some of the biggest TV audiences of any winter sport due to its exciting head to head nature and it is also one of the most exhilarating snowsports disciplines to take part in. 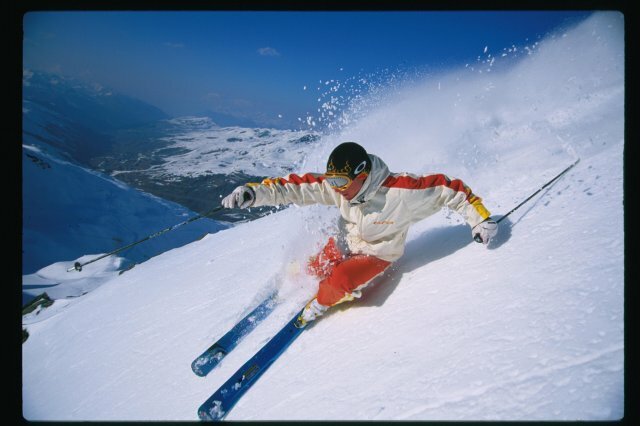 If you fancy giving Ski or Snowboard Cross a go, you will need to be a relatively competent skier or snowboarder already, happy going pretty fast and going around berms (banked corners). The best way to try it for the first time will be at your local slope, particularly if you live near an indoor snow centre. Once you have caught the bug and got a few races under your belt, you might find yourself out in Laax in Switzerland competing at The British Snowboard and Freestyle Ski Championships, also known as The Brits. There are both Ski Cross and Snowboard Cross competitions with prizes for all age categories, including Under 12s.